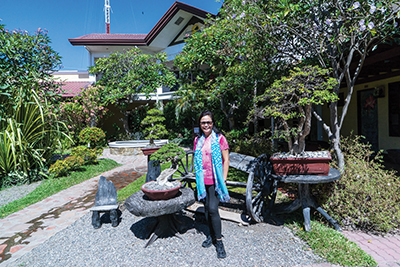 Sylvia Andres went home to her family in Nanyo, Panabo, Davao del Norte and was entertained by the Sacred Heart Andres-Arguelles Legacy GK Villagers sitting for 3 hours early in the evening wearing slippers without socks on. She went to General Santos to visit her cousins a week later and while enjoying the seaside resort at Long Beach she felt a bone-crushing muscle and joint pain, fever and headache. Two days later while doing a medical mission in Koronadal, South Cotabato with Tau Mu Sigma Phi Fraternity her platelet count was found to be only 36,000. Dengue fever was suspected. 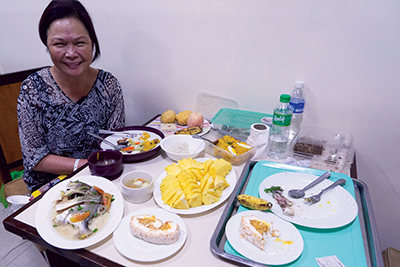 She was immediately hydrated orally and parenterally and was transferred to General Santos Doctors’ Hospital where an apheresis machine was available for possible platelet transfusion. Dengue fever was confirmed with positive serological tests including NS1 and IgG and IgM antibody titers. 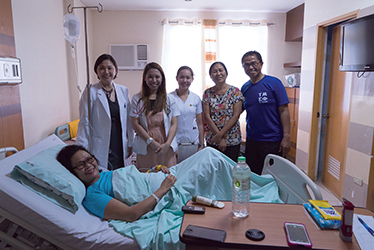 Fortunately she did not need to have transfusion, thanks to the excellent care from the local physicians especially Dr. Lucy Yap, UST Med ‘92, Internal Medicine and Endocrinology who was her primary care physician, and Dr. Noel Pingoy, who was her Hematologist. News of Sylvia’s illness spread like wild fire. Well-meaning friends and relatives mobilized practically all resources and gave their advice on how to deal with Dengue. Friends from Davao wanted her moved there. Manila was out of the question because of the need to fly. Return to US, where she would have been a ‘reportable case’, was even suggested. A good friend made sure the Rotary Club of Mindanao was alerted so that prospective donors of platelets were lined up. Tau Mu brothers volunteered to be donors as well. The local blood bank was told to make sure platelets were available in case of emergent need. Everybody in the hospital had a suggestion to make and an advice to give including the housekeeper who had her own concoction to offer. But one thing in common was the advice to drink as much “tawa tawa” brew as much as possible. And so her cousin went home to harvest the weed and had them boiled like tea ready for everlasting consumption. What helped a lot was good nursing care provided by the hospital staff and especially by special nurses: her sister, Lela, and nephew, Andrew, who stayed with us in the hospital suite all that time, offering two liter-bottles of hydrite at a moment’s notice. This, we were told, was the secret of the successful management of Dengue fever. Those cases that did not have a good outcome were usually those who could not drink due to GI upset that not uncommonly accompanies the illness. Fortunately, Sylvia did not have that problem. There was a sense of relief and anticipation of recovery the following day when a rash appeared in her legs, the Herman’s rash. The platelet count though continued to go down to the lowest level of 20,000 keeping us at bay. And when finally it started rising and with appearance of megakaryocytes, she developed a bad splitting headache that made us think of intra cranial bleeding. Quick reading on the disease however confirmed that headache can be anticipated during the recovery phase probably resulting from cerebral edema as fluids from interstitial spaces are mobilized. Drawing from my ICU experience of using hypertonic saline solution to minimize brain edema, I urged her to drink more of the salty Hydrite solution. Although she was clinically feeling better on the fourth day, her platelet count was only 76,000 and it was thought that it was still too low for her to be flying safely. We had already moved back our return flight to the USA one week. 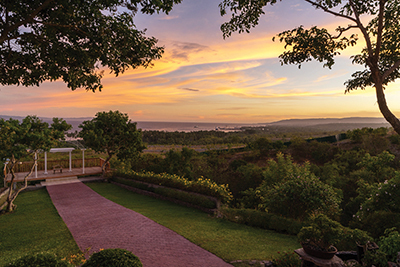 We decided to use the rest of that week for an unexpected vacation at the Sarangani Highlands Garden that is owned by Dr. Anabelle Abella who is friends with two of Sylvia’s closest friends from Davao. 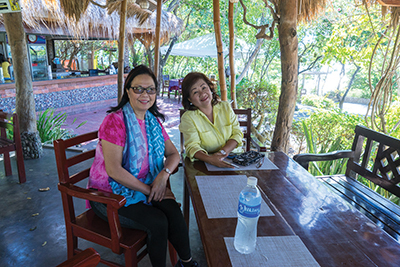 We found her a very interesting and entertaining and a wonderful person We were given the largest two-bed second floor room overlooking the gorgeous view of Sarangani Bay. 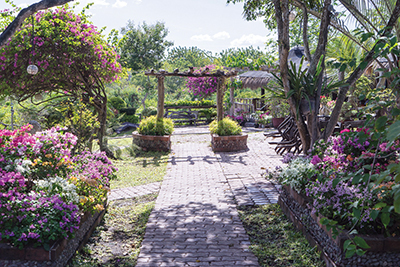 The whole hotel property was like paradise for gardeners. There were flowering plants all over. The restaurant serviced several pavilions that could accommodate groups of various sizes. There was live music by a 3-man band most of the evenings. The menu was marvelous and it offered a lot of local dishes all of which we tried to sample. But my personal favorite was the deep fried tuna tail that was prepared like a crispy pata. Ummmm! There was after all something good to be said about getting sick. Ha ha ha! So what is Dengue Fever? Dengue is caused by a virus that is closely related to the one that causes Yellow Fever, West Nile and Japanese encephalitis. 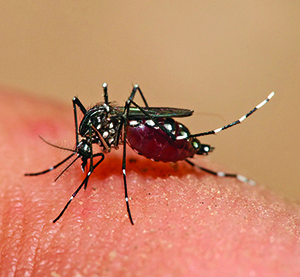 It is carried by the Aedes mosquito principally the Aegypti species that gets infected after biting an infected person. The virus eventually settles in its salivary gland. The mosquito passes this on by biting another person and releasing its contaminated saliva. The mosquito tends to live closer to human beings living in stagnant pools of water, old cans and tires and similar environments. Symptoms typically appear 4-7 days after the bite as a febrile illness accompanied by severe generalized body malaise earning its nick name of “breakbone fever”, headache and skin rash that blanches with pressure. There can be vomiting and diarrhea that can limit oral hydration. Mucosal bleeding around the nose and mouth may occur. These symptoms result from the body releasing cytokines and interferons to combat the virus. This febrile state is soon followed by the critical phase where there can be capillary permeability leading to tissue swelling, ascites and/or pleural effusion and intravascular fluid depletion that can lead to organ failure and increased hematocrit. Bone marrow involvement can lead to severe thrombocytopenia and bleeding, and in the worst of situations, death. These are brought about by the virus particles occupying the cells and taking over their functions to replicate more viral particles. And finally as the body produces IgG and IgM antibodies against the virus, recovery takes place about a week into the illness. Platelet count starts rising. The fluid that had leaked out starts getting reabsorbed and this may sometime lead to volume overload and cerebral edema that can lead to headache and altered mental states and seizures. 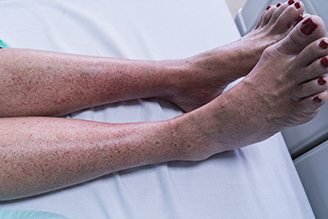 A new kind of skin rash that looks like “islands of white in a sea of red” called Herman’s rash usually appears. There can sometimes be itching. Easy fatigability may persists for weeks. Dengue fever is endemic not only in Southeast Asia but also in China and India, Central America, the Caribbean, and even Northeastern Australia. And now the same Mosquito carrier is responsible for Zika virus that causes microcephaly in the newborn that is so highly publicized. And do not forget our old nemesis, malaria. How do we prevent it? Let’s get rid of the mosquitoes by eliminating their reservoir. Avoid getting bitten by them. In addition to using “Off” and “Citronella” sprays, wear long pants and long sleeves and shoes with socks especially when out in the evenings and early mornings when they are in the hunt. Let us not fall prey to these blood suckers. More novel ideas like releasing small fish called guppy in ponds that eat mosquito larvae and genetically engineering male mosquitoes that can lead to baby mosquititos that cannot fly are being tried. A vaccine is even now available. In the long run, prevention by attacking the carrier that causes so many diseases will probably prove more effective. Down with the mosquitoes!